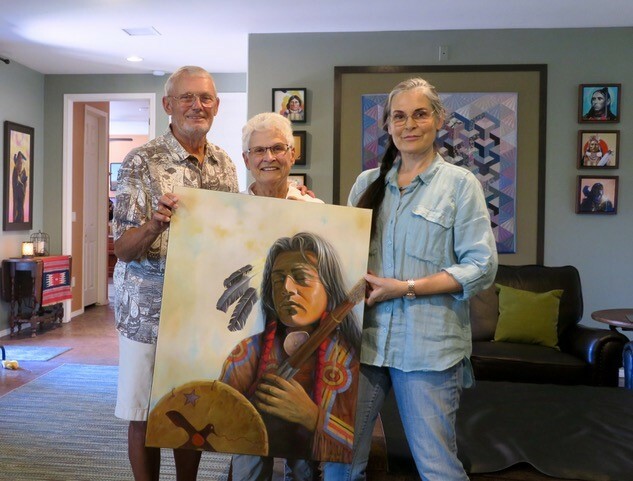 Karen, right, with Jim and Sandy Heuerman, with a piece the Heuermans purchased. Karen Clarkson is a Native American artist who strongly identifies with being Choctaw, and she is motivated by her heritage, as portrayed in her series of artworks titled “A Choctaw Story of Land and Blood.” This project came about through Karen’s discovery about her own roots and how to present her research through her art, raising the issues and effects of blood quantum throughout history to the present. 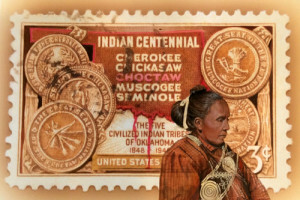 Aside from the educational presentation of this series, the art is trying to reach into the historical narrative of the Choctaws and reach other Natives and non-Natives with the story. Karen is a self-taught artist who has been expressing herself through art as early as she can remember, with a focus for many years predominately on portrait art. Her professional career as an artist developed after her children had left when she was in her thirties. “I want to somehow bring people together through seeing themselves in someone else’s face,” she said of her art. “I want people to feel that connection and to change them somehow, which is not something you can teach, it has to come from a feeling deep down inside.” Today, she is a certified woman-owned, minority-operated business, dedicated to showcasing her art at Indian markets and Native productions. 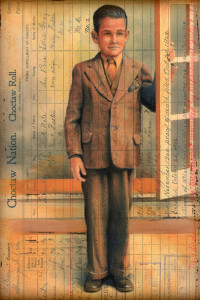 Similarly, Karen mentioned the Stigler Act, which states that the allotted lands held by citizens of the Choctaw, Chickasaw, Cherokee, Muscogee (Creek) and Seminole Nations must possess more than one-half blood quantum in order to inherit land from their forbearers and retain it as “Indian Land.” In the early 1900s, the five tribes had 15 million acres, and that number was down to 381,000 acres by 2015. Specifically, 6,952,960 acres were allotted to individual members of the Choctaw Nation, with a significant loss to 135,263 acres by 2016. In 2018, the Stigler Act was amended to remove blood quantum minimum requirements for holders of tribal allotment land. Karen was introduced to First Nations by longtime supporter Jim Heuerman. After reading through First Nations’ Reclaiming Native Truth project materials, Karen found that the messaging resonated with her series, and that she had been looking for a concrete way for people to find a call to action in changing the Native narrative. 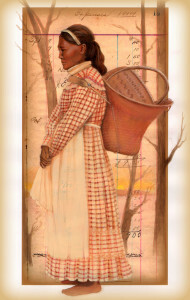 With her series “A Choctaw Story of Land and Blood,” she is hoping that the portraits and stories can resonate with Natives of all nations and that they can recognize themselves within this narrative, and that non-Natives will be able to obtain a clearer picture of history and see how it not only applies to Native Americans, but to people of all other ethnicities.